My grandmother (dadi) passed away on March 1, 2012. It has been six years and I still find it difficult to talk about her death since I was extremely close to her. We lived together till I got married and I used to sleep in her room. There are many things I learnt from her and she stays relevant in my life as I think of her almost everyday. 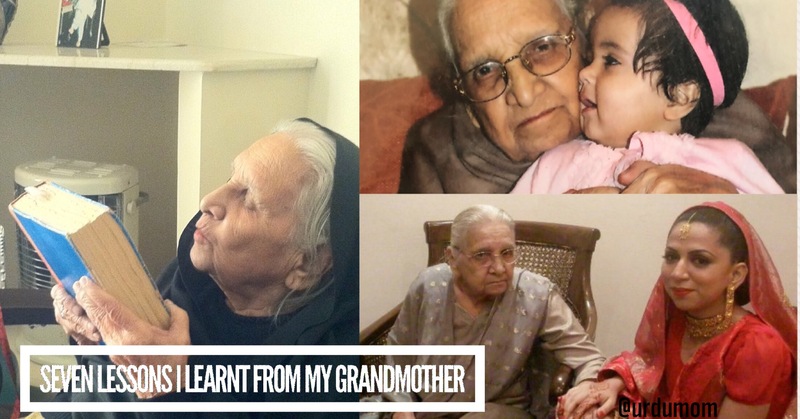 Sharing seven big lessons I learnt from my grandmother. My dadi immigrated to Pakistan from India at the age of 21, seven months pregnant with my phupo, her first child. She was the pampered daughter of her landlord father in Sonipat village in India (near Delhi) but was married to a simple school teacher because her father valued education over wealth. All her life she adapted and showed resilience in the face of life's challenges. She shared her stories with me of how she was quite the princess before and then moved into a two-room house when she got married. How they immigrated to Pakistan in the midst of riots and barely made it to Rawalpindi on train. How they were allocated a small house that belonged to a Sikh family, who had moved to India, and how she always wondered about them. How she made friends after knowing almost no one in the new city and found her roots. Her stories helped me a lot as I moved to Canada myself after getting married and I applied her lessons as I built my life. My dadi would insist that I make my bed every morning saying that it was the only way to start the day right! This has now become a habit that I can't shake off. Research supports my dadi's lesson and making the bed in the morning is correlated with better productivity and wellness. My dadi taught me how to say my namaz. She also taught me the importance of prayers and duas. She was regular with her namaz and her duas were long and detailed. If you were sitting close to her while she prayed you could hear all her duas as she would say them out aloud. I was always amazed at how she included everyone in her prayers. For my dadi family was everything and she strived to keep everyone together. Nothing made her happier than a family get together. If there were any misunderstandings amongst family members she would mediate and spent all her time and effort in gluing the family together. One of her morning rituals was calling all her children, nieces, cousins, grandchildren and other relatives for a quick call to find out if everything was OK. While family was everything, my dadi always made time for friends. She modeled the importance of deep friendships for me. She had friends everywhere and loved to socialize. My dadi and nani (maternal grandmother) were friends before they got their children (my parents) married off. They always stayed firm friends and would joke that they will prove the cliches about inlaws wrong. My dadi had a treasure trove of urdu phrases that she would use at the appropriate occasion and one of my favorite ones was "mehenga roay eik bar, sasta roay bar bar". I'm reminded of this golden lesson many times when I make important purchasing decision for the house such as a new appliance and always invest in quality. My dadi quite detested screens. She would tell us back in the 80s and the 90s that don't watch TV before sleeping and now research supports the link between screens and lack of sleep. She loved a one-to-one gupshup without the distraction of TV and smart phones. I still have to work more on this one. As I write these lessons I learnt from my grandmother, I realize how much of an impact my dadi has had on my life and continues to this day. Please say a prayer for her. Are you close to your grandparents? What lessons have you learnt from them? May Allah swt bless dadi with the highest place in jannah. Our elders are certainly a blessing in the true sense of the word,both in their lives and afterwards. Such a sweet post… Brought tears to my eyes. Makes me miss my own Naani and Naana, who I grew up with, and who passed away. They are in my thoughts every day. I never met my Dadi/Dada, since they passed before I was born. Thanks so much for sharing! May Allah swt bless your Dadi with Jannah! May ALLAH grant her the highest ranks in Jannat. Ameen. It’s always very alluring to read what you post and is equally informative too. What I learnt from my late grand mother ( dadi) was that she would never miss her prayers. She had a splendid taste in the food that she cooked esp aalo kerna…She preferred serving the guests home made food…. and the list goes on. We,too lost her in 2012. MAY ALLAH grant her the highest ranks in jannat. Ameen. Allah unki maghfirat farmaiy, unki qabar ko Apnay noor say munawwar rakhay and Jannat ul Firdaus k aalaa say aalaa darjaat ataa farmaiy. Aameen, Summa Aameen Ya Rabbul Aalameen. Duniya aisay buzurgoun ki kami hai. Nowadays buzurgoun ka ajeeb haal hai. Such a beautiful list of lessons. Thanks for sharing . May Allah grant her highest place in jannah! I still remember how we used to go to her room to say quick salam and then run to your room upstairs ! The presence of grandparents makes your house so much full of barkat. The best thing I learned from my grandfather (dada) is how to keep your integrity intact in life. He had so many stories to tell of himself and his father where they did not compromise on their integrity even in the most difficult times. Awww now I just want to keep on writing about him 🙂 I wish our parents live long enough for our kids to know them more the way we knew our grandparents. Ameen. My naani passed away on March,9th 2012. She struggled and went through A LOT. She was a widow when my khala was just 19 days. We stayed with her all our life and it was her death was the hardest thing ever! May Allah forgive all our elders and grant them the highest place Jannah InshaAllah!!! My naani always used to emphasis the importance of prayers & to meet people nicely rakh rakhao kay saath.